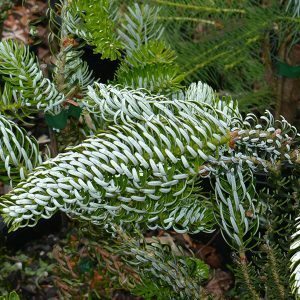 With attractive green foliage which grows with recurved or twisted needle that reveal a silvery reverse, Abies koreana Silberlocke is an evergreen conifer that will eventually reach around 5 metres plus in height. Best grown in a sunny to part shaded position, growth rate is slow and thesis a conifer suited to growing in containers. The attractive foliage also makes it well suited as living Christmas Tree. Growth habit is loosely pyramidical, and like most conifers grows well in a slightly acidic soil. Container grown specimens are usually restricted a little in height and growth rate. Also known as Silberlocke Korean Fir and ‘Horstmanns Silberlocke Korean Fir’. Attractive cones will appear along the branches in season. These begin as a deep purple and will appear when the plant is quite young. Like most Korean Firs, Silberlocke is best left unpruned as the natural growth habit is the most attractive. Plant Abies koreana Silberlocke in a humus rich and well drained soil. Water regularly through the first summers. Once established the plant is relatively drought tolerant. In very hot summers regular deep watering will be beneficial. It may take 10 years to reach 3 metres in height, however eventually it will out grow its container. Spread – Will spread to 2 metres.